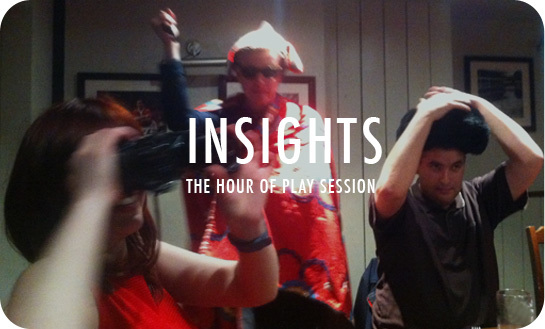 The Hour of Play is an experimental research project looking at ways in which play can facilitate creative thinking in adults. By focusing on a problem solving approach to creativity the study looks at the links between two seemingly related fields, psychoanalytical processes and the cognitive approach to creativity. Seen from a neurological viewpoint the two fields appear to describe a similar process. Both can be seen to describe creative thinking in relation to an increased access to the associative network; being described as divergent thinking in the cognitive approach and as primary process in the psychoanalytical literature. The field of child development shows that fantasy play facilitates access to, and can develop primary process thinking. Research tests with children provide evidence that once engaged, this mode of thinking directly correlates to an affect state that is conducive to creativity as defined by the cognitive approach. The definition of fantasy play is identified and, based on the key determinants of the term, methods are examined that could be used to generate similar processes in adults. An action research methodology was undertaken in the form of workshops that encouraged specific play related activities within adults. Correlations between play and an increase in associative thinking, in highly creative and lesser creative individuals, were found to occur that appear to correspond with theories of both psychoanalysis and creativity. These findings are discussed in relation to both the literature of child development and the cognitive approach. Project limitations and the potential for further theoretical and applied research are also presented. Based on the findings a model for an empirical research test which could show that play can benefit creative thinking in adults is presented as a conclusion. Poincaré’s quote tells the tale of how, after working on a mathematical formula for two weeks, he was able to find his solution whilst in a state of reverie where he saw his ideas forming before his eyes, as a result of these visions he was able to formulate the theory of fuchsian functions and groups. That particular evening has entered into the legends of creative studies and has long been held up as evidence by those who believe that the links between the subconscious and the conscious mind are intrinsic to a person’s ability to create new concepts and products by piecing together seemingly disparate and unconnected ideas. This genius view argues that creativity is a rarefied and unique gift that is only available only to a chosen few. Luckily for the rest of us there is another argument. One that suggests that creativity is inherent in everyone. This argument stresses that once the cognitive processes, which allow us to think creatively, have been identified we can then train and developed them in order to improve our creative output. My research falls somewhere between these two opinions. In recent years technology has enabled us to look at the neurology involved in creative thinking but the research is still very much ongoing. I believe that the links and the ability to access the subconscious do play an important part in creative thinking, which is why it is easier to find the answer to a problem when you enter a state of reverie or a similar change of thought pattern by going for a walk/run, having a bath, or via a massive caffeine hit… a lá Poincaré. But i also believe that once we are aware of our creative processes, or methods of generating subconscious links, then we can develop these processes and improve our accessibility to them. My direction came from a quote by Picasso, who stated that “All children are artists. The problem is how to remain an artist once they grow up.” So I have turned to the field of child development for an answer. Research evidence suggests that certain types of play can help to develop crucial psychological processes, which allow access to the subconscious and facilitate certain characteristics that are used to measure creativity. My question is this, can these processes be triggered in adults by using styles of play and creative enquiry, and if they can will they have the same benefits? 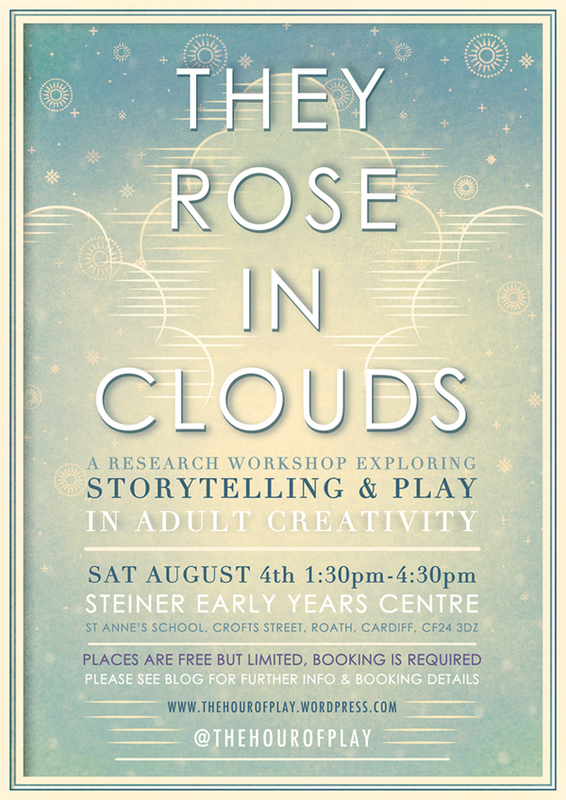 The workshop has been designed around exercises that are intended to encourage these processes; the aim will be to engage a sense of creative enquiry through play and will involve drawing, writing and storymaking. The workshop is based on findings from a previous trial, but has been developed significantly from the original event, so those who attended the first trial will be in for a very different experience. Spaces are free but will be strictly limited. This is partly because the group will be kept small in order to maintain a comfortable environment, but also because there are a limited number of special items which will be key to the workshop. I have asked that anyone who is interested in coming to please “book”… by which I mean send me an email or twitter me @thehourofplay. Thank you. 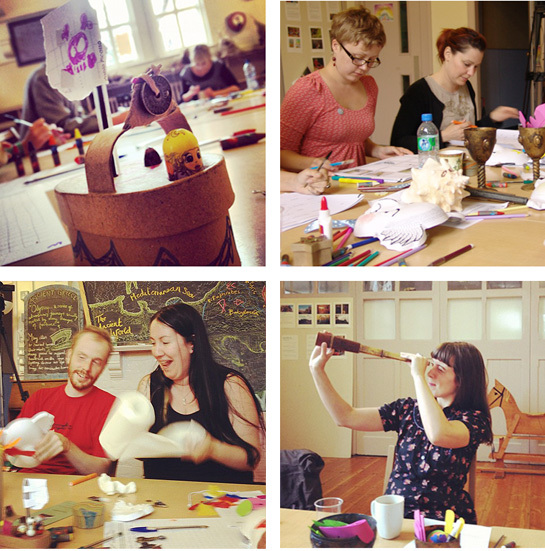 The intermediate project explored ideas of psychoanalysis and explored how these ideas relate to theories found in both creative studies and play theory. 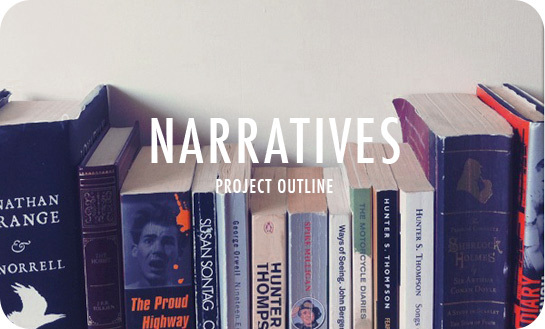 Areas of insights resulting from this project are; primary process thinking in adults, generating creative enquiry, play as a creative environment, and (unexpectedly) the relationship between play and narratives. My intention was to continue solely on looking at the primary process and creative enquiry part of the project, but on reflection I have decided to follow up on the most unexpected result from the practical intermediate study; narratives and play which I am increasingly seeing this as a very exciting and key part of the project. The links and more importantly the relationship between narrative and play when engaged in personal creative output will be the main focus of the Final Major. The concept I am working towards is that play can facilitate a creative approach, and narratives are the structure that can guide play in that approach. Narratives and play, when both are allowed to be open-ended means, can support each other in creative exploration. It seems that play allows us the freedom to explore within a risk free environment whilst narratives grant full control of that environment. As the nature or need of the enquiry changes so too can the environment be changed and adapted in order to accommodate these needs and therefore benefit the enquiry. 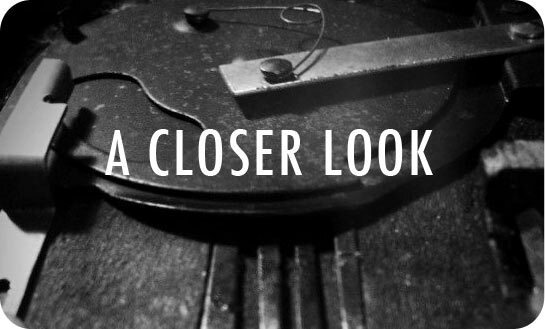 Whilst psychoanalysis showed both a way of linking play with creativity as well as a means to explore these concepts, I intend to look at psychotherapy as a way of developing the potential impact of these initial insights. I recently held an event that aimed to put into practice some of the key concepts that have informed my research. The main focus of the event was to see whether it was possible to encourage primary process thinking in adults through play, and to gain insights into any affect that this could have on basic measurements of creativity. Below is the supporting video documentation showing the environment, structure and feedback of the event, the write up that follows explains the aims and methodology of the session. The writing is a brief outline of the main paper in which the literature review, limitations, outcomes and further areas of development are explained in greater detail. Research by Dansky and Silverman (1973) suggests that fantasy play in children encourages associative thinking, and appears to encourage a state of affect that is beneficial creativity (using the term as defined by research lab tests). The question I wanted to ask was whether play in adults could facilitate a similarly creative benefit, the first step was to see if this style of play could be encouraged within adults, and if so how. Therefore my approach for the session was to reverse the methodology outlined by Dansky and Silverman and so see whether encouraging associative thinking could be used to trigger determinants of fantasy play within adults. Fantasy play is defined as the style of play in which a child can adopt more than one role at a time, i.e. supplying narrative for both the princess, and at the same time, the prince. In this instance I chose to encourage fantasy play through the use of loose and undefined narratives. This was not based on any previous research studies I had uncovered but was devised as a method which I felt might be accepted by adults, and was a way of leading participants into continuing an open ended story and thus assuming new roles or viewpoints. At the beginning of the event participants were invited to engage in a series of short exercises that I had put together with the intention of encouraging primary process thinking. 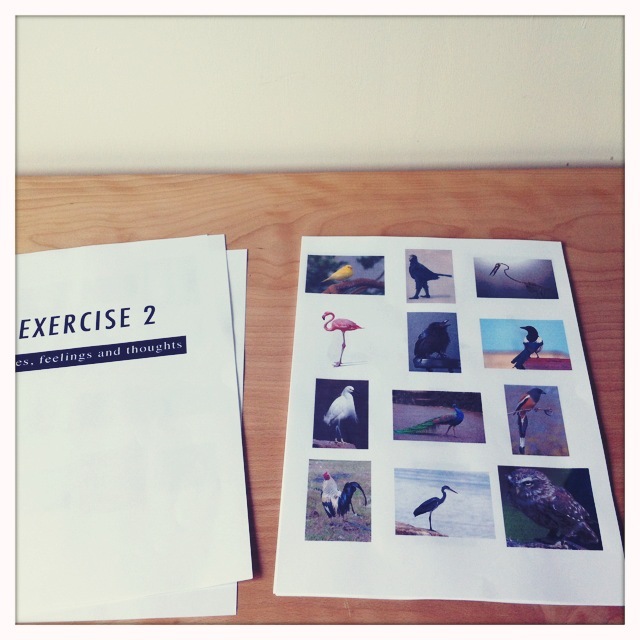 The exercises required participants to form associations between photographs of various objects, as the exercises progressed they grew increasingly difficult as the objects became ever more unrelated (such as birds, household objects, and modes of transport). It was hoped that increasing the difficulty of the exercises would encourage participants to make further and more random leaps of association in order to complete them. The overall aim of this part of the session was not to test or measure the creativity of participants but simply to “prime” the associative network process through primary process thinking (both processes are described in earlier blog post) and to see what affect this would have on the following part of the session. Following the association exercises there was a short break before the second “play” section of the event. 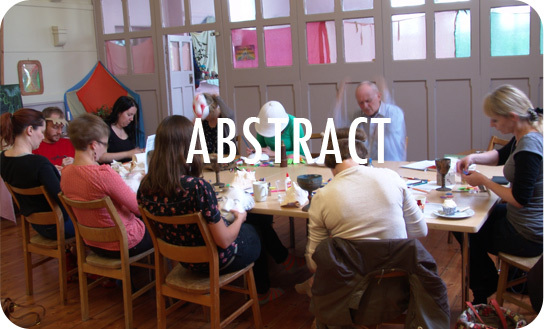 This entailed an unstructured period of time during which the participants were invited to freely engage with a selection of props in any way they wanted, there were no prompts or instructions, the props were simply laid out onto the table. 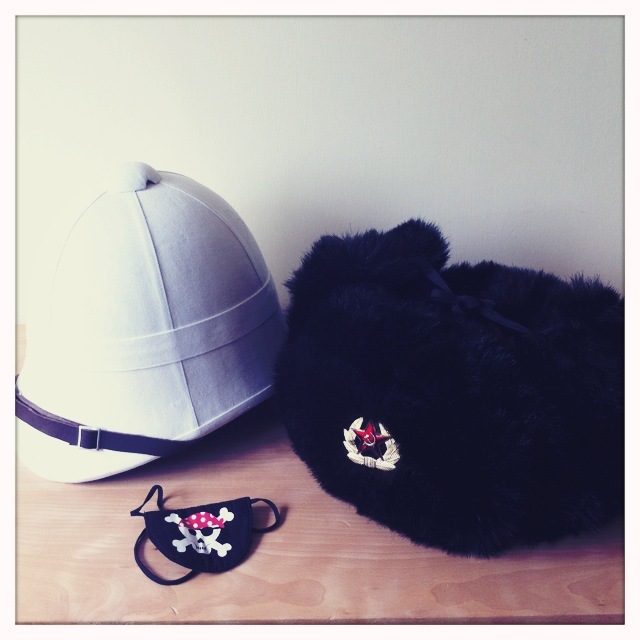 The props fell into three categories, first were items that had been chosen in order to free any social constraints of adults in relation to play and to encourage group interaction, these were on the whole dressing up items and included a British pith helmet, a Russian Ushanka, a child’s pirate eye-patch, and a Maasai blanket. Second were items intended to trigger interest or enquiry through physical interaction or reflection upon the nature, age, and characteristics of the object, these items included: a vintage pair of binoculars, fossils, antique coral, an African spear, a magnifying glass, and Victorian era coins from the early 1900’s. Finally there were items which were intended to act like small time capsules, collections of mementos from travels and adventures; these were vintage boxes and tins into which were placed period coins, pieces of ribbon and several stock photos that had been printed and distressed in order to resemble antiquated photographs. The images in these containers were intended to relate back to the association tests the participants had undertaken in the earlier stages of the workshop, and it was hoped they would act either as primers or reminders of the tests in which the associative network (and hopefully the primary process) had been triggered, therefore the images appeared related to one another by means of an undefined narrative. After around twenty minuets of free play a second set of exercises were handed out to participants. These consisted of images relating to travel and history and were loosely linked to the items used during the free play session. There were no prompts, instructions or requirements to complete all or any of the exercises, they were a mix of both drawing and writing exercises. All of the participants engaged in, and completed, every single exercise in what was the quietest and apparently most focused part of the session. After the feedback session the event ended with a game of lucky dip called “Poundshop Roulette.” The game was intended both as a way of thanking participants and as a closing mechanism that maintained the feeling of fun and play. The items in the game were stuffed toys, a mechanical penguin slide, an antique dart firing pirate gun, a “make your own stunt kite” book, Roald Dahl books, and a Donny Osmond record (nobody “won” the Donny Osmond record and I still own this). As previously stated my intention was not to test, or measure the participants themselves but was focused on recording their feedback concerning their thoughts and feelings on the process; this feedback will be used to gain insights into development for the final stage of the project. In psychoanalytical research primary process thinking is defined by the displacement of ideas and images, here random association and ideation condensation lead to symbols and meanings becoming interchangeable (Arlow & Brenner, 1964); i.e. the association of objects by shape, colour and physical characteristics, can also result in one object becoming another through conceptualisation. The primary process is also commonly described as being a free running and subconscious process that relies on association and can therefore be seen as being random, instinctual, illogical, and child like. Throughout the exercises nearly all participants showed definite signs of primary process thinking, during the feedback stages six of the seven participants referred directly to aspects of this mode of thinking, albeit with apparently varying outcomes. The most surprising results were the fact that two participants appeared to have profound insights into their own thought processes by recognising recurring motifs of morbidity in one instance, and romance in another. In this regard further research (possibly in the field of expressive therapy) may be undertaken to identify whether this was as a result of engaging with narratives and asking to what extent accessing the primary process had on this form of engagement. Secondary insights were concerned with engagement, the role of the researcher, and issues relating to the stripping away of control or instructions and the resulting beneficial and detrimental factors this appeared to have on creativity. The session seemed to suggest that adults can engage in primary process thinking and, from participant feedback, that it appears to change the mind set in relation to creative output; however the session was not set up to measure or test any benefit of this, merely to identify ways in which the thought process could be achieved. Further studies will look at fine-tuning the exercises to further encourage this process and will also look at the possibility of introducing a “before and after” creativity test as a measurement tool. Arlow, J, & Brenner, C, (1964). Psychoanalytic Concepts and Structural Theory. New York: International Universities Press. Dansky, J. L. & Silverman I. W. (1973). Effects of Play on Associative Fluency in Preschool Aged Children. Developmental Psychology, 9, (1), 238-43. On Wednesday 16th of May I am running a small research study based on a couple of the creativity theories I have explored so far. The exercise will be in three parts and will be using an artistic definition of creativity so each exercise will involve some degree of either drawing or writing, however skills in these areas are not essential as time limits won’t allow anyone to create a piece of outstanding beauty, we’re talking stick men and scrawls really. The underlying concepts being looked at will rely on communication rather than artistic capability. This is the first research study of this project and my main intention is to gain insights into a couple of key concepts that will be developed, over the next few months, into a larger and more rounded workshop or event. Participants will be given the opportunity to win a prize in a game of “Poundshop Roulette”; however the small print states that this will depend on the prizes to participant ratio as well as the participant’s definition of a prize and level of expectation. I have booked a back room in the Owain Glyndwr and we shall be meeting from 7.00pm on Wednesday, I envisage running the study in 2 or 3 small groups, depending on numbers, so there will be some time spent socializing in the bar area which is never really a bad thing and can also boost creativity. Honest. I hope you can come, it wont be the same without you. If creativity is considered as a cognitive process then the mental operations involved in the scanning of stored memories, and their associative meanings, become an important starting point. Although there is certainly much more involved in generating creative output (motivation, environment, knowledge), this mental scanning is recognised as a significant factor; many creativity tests have been based on the ability to come up with alternative uses for objects, whilst many training techniques relate to the ability to make associations between words based on their associative physicality or concepts. 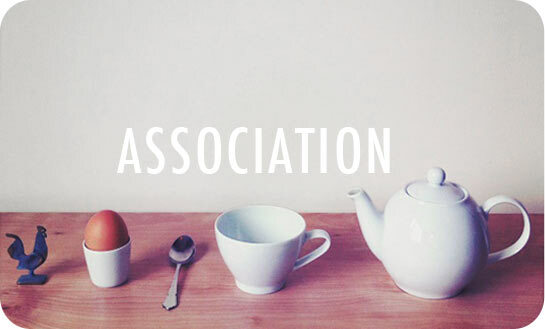 Research tests have confirmed that more creative individuals are likely to make a greater number of associations, and also to make further reaching or more remote connections that result in surprising or unexpected associations. This ability can be defined by Bower’s theory of associated network, which assumes that memory is organised as a semantic network; an object or an event is organised into a memory group consisting of all concepts, opinions and emotions which relate to that object or event. These memory groups are triggered by a node, a kind of beacon, which when activated initiates the retrieval of this stored information which radiates from the beacon like a ripple effect. 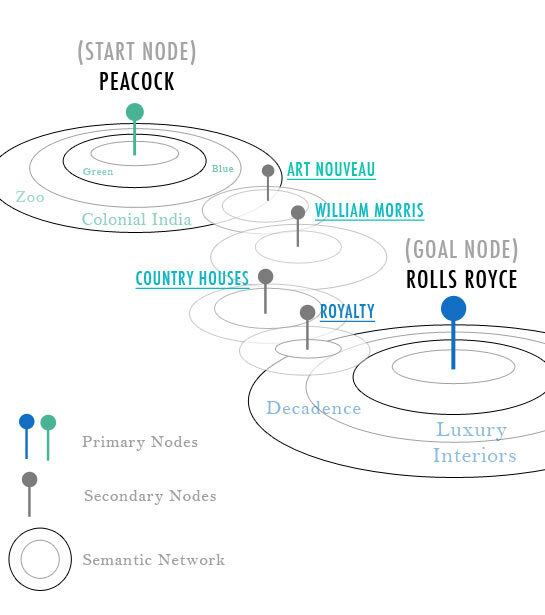 Associations between two different objects or concepts can occur when the initial node triggers a smaller interim node, which is located within the initial memory group, this acts in a similar way and spreads its own associations which can then activate a chain of further nodes until a satisfactory goal is reached. In their paper exploring the relationship between creativity and associative memory, researchers Gruszka and Necka, found that subjects who were considered to have a higher level of creativity were more open to the possibility of associations and that these subjects spent longer time making their decision as to whether connections could be made. This led the researchers to conclude that these creative individuals were accessing larger reaching ripples of information and developing a longer, and more time consuming, chain of nodes than the less creative subjects. The ability to make these conceptual associations seems particularly relevant to the fields of illustration or graphic design but as Bower’s theory of association also relates to emotion it could also be seen as significant to a wider field of artistic creativity such as fine art or poetry. Once the process is identified the obvious question to ask is whether a tool can be developed that can facilitate the development of the semantic network, to increase creative output. Exercises to develop associations are the basis of many concepts as outlined by De Bono, however he is often criticised for not providing a theory to justify his ideas or showing evidence for their benefit (one of my favourite literary criticism was penned by William Hartston writing on De Bono). However, Gruszka and Necka found that priming of the nodes resulted in a greater spread of activation and led to a greater acceptance of associations in a verbal test, which raises an interesting question of whether this process can be primed in a lab test based on another creative practice such as drawing, and one that would make a more grounded starting point of investigation. Gruszka, A., & Necka, E. (2002). Priming and acceptance of Close and Remote Associations by Creative and Less Creative People. Creativity Research Journal. Vol 14, No 2, pp. 193-205. Mednick, S.A. (1962). The associative basis of the creative process. Psychological Review. 69, pp 220-232. Creativity as a cognitive process. Finke, R.A., Ward, T.B., & Smith, S.M. (1992). Creative Cognition: Theory, Research, and Applications. Cambridge, MA: MIT Press. 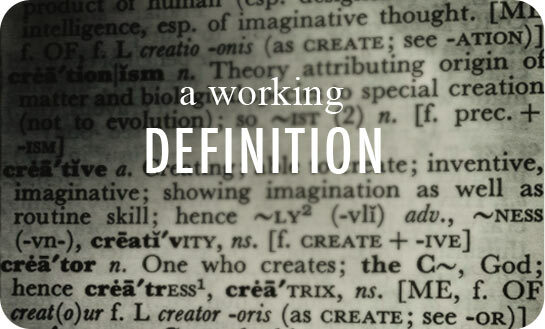 Creativity is a term with a myriad of meanings and theories, in order to approach the subject a definition is essential. What follows is a quick literature review and my working definition for the term. E.P. Torrance was a prolific psychologist who, from the late 1950’s, dedicated a lifetime of work to the field of creative studies, and is responsible for many theories and lab tests that continue to inform the subject. Yet despite years of researching the subject Torrance maintained that “Creativity defies precise definition.” One reason for this conclusion is that the term is used as a catchall description which is applied to just about anything positive which can be made; such as writing a haiku, painting a portrait, composing an opera, formulating a chemical equation, or developing a new sales strategy. Expressive creativity, as in the spontaneous drawings of children. Productive creativity, as in artistic or scientific products where there are restrictions and controlled free play. Inventive creativity, where ingenuity is displayed with materials, methods, and techniques. Innovative creativity, where there is improvement through modification involving conceptualizing skills. Emergenative creativity, where there is an entirely new principle or assumption around which new schools, movements, and the like can flourish. Taylor emphasised that when talking about creativity most people instinctively use the fifth, and most rare, definition of creativity. This raises another problem with the catchall use of the word, in that when asked to think of someone creative a common response is to name a genius such as Da Vinci, Mozart, or Einstein. This linking of creativity with exceptional genius can result in the dangerous misconception that creativity is a rarefied domain of a select few, and an area which should not be approached by anyone but the gifted. Thurstone (1952) reinforced this idea of creativity as a rarefied gift by emphasising that in order for anything to be described as creative it must meet the criteria of being new, unique, and most importantly it must be regarded as valuable to the field in which it is intended. Therefore the light bulb, the theory of evolution, the Marriage of Figaro and Hamlet can, by this definition, be regarded as creative. One problem with this definition is that very novel products can often take a long time to be accepted by their field, examples from the art world include works by Monet and Munch, and in the field of medicine can be seen in the research of Marshall and Warren, whose research took over ten years to be accepted. In a review of popular lab tests designed to test creativity (including Dunker’s candle problem), the cognitive psychologist Robert Weisberg demonstrates that in order to solve a problem subjects first attempt to find a solution by applying existing knowledge, when this is found to be lacking attempts are made to determine and address the inadequacy. Thus the problem solving process involves a series of incremental steps whereby “The solution could be conceptualised as multiple searches of memory, in the sense that each step in the solution, if judged to be inadequate, serves as the cue for further retrieval of information.” This leads Weisberg to conclude that each step of the problem solving process can create a new problem until a solution is reached, therefore “any solutions should be considered creative, so long as they are novel as far as the problem solver is concerned.” In essence creativity is achieved if the product; albeit an idea, a painting, or a critical argument, is novel and unique to the individual. In looking at the works of creativity as previously mentioned that satisfy Thurstone’s description we can see, similarly, that these works were not the result of superhuman leaps of creative genius, but were the result of a series of incremental insights and trials. Edison is purported to have made over 5000 (depending on the source) inadequate tests before successfully making the light bulb, Darwin reached his theory of evolution by personal reflection on previous theories by other writers including Malthus, whilst both Mozart and Shakespeare are known to have penned an inordinate amount of preliminary work which was not seen as credible to the field. Therefore if we consider creativity as a cognitive process it seems apparent that in order to achieve Thurstone’s definition of uniqueness, one must work through a series of incremental stages whereby the results are unique to the individual. This suggests that the cognitive process involved in these great feats is the same as outlined by Weisberg and that, given the correct motivation and application, is therefore available and practiced by everyone. My study will focus on the second level of Taylor’s model, that of Productive creativity, and specifically address the question of how play can affect and facilitate the creative process. I will be taking a cognitive approach to the subject and look at the thought process involved, in doing so I also hope to look at links between artistic creative and everyday creativity (problem solving). Thurstone, L. L. (1952) Creative Talent. In Thurstone, L. L. (Ed): Applications of psychology, New York: Harper & Row, pp. 18-37. Torrance, E. P. (1988) The nature of creativity as manifest in its testing. In Sternberg, R. J (Ed. ): The Nature of Creativity, Cambridge University Press, pp. 43-75. Weisberg, R. W. (1988), Problem Solving and Creativity. In Sternberg, R. J (Ed. ): The Nature of Creativity, Cambridge University Press, pp. 148-177.